This article originally appeared on Tasting Table, a website for savvy food and drink enthusiasts. "I can quickly break it down to you—how we've gotten to where we are at right now," Alvin Cailan, the L.A.-based Filipino American chef and owner of Eggslut, says. He's talking about the way Filipino dishes, like chicken adobo flavored with bright calamansi juice and cane vinegar (see the recipe), are appearing at critically acclaimed restaurants across the country. 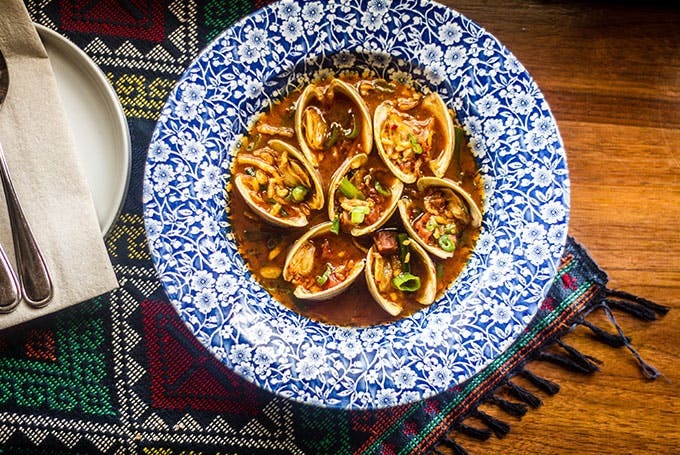 Diners are becoming more familiar with the complex flavors of the Philippines, a nation of more than 7,100 islands with historical influences from Indonesia, Malaysia, China, Spain and the United States. They're craving lumpia (spring rolls), kinilaw (ceviche) and sisig (a sizzling platter of chopped pork amped up with acid and heat) from restaurants like Bad Saint in Washington, D.C., LASA and RiceBar in Los Angeles, and Chefs Club in New York, where Cailan, who is also writing a Filipino cookbook, will host a pop-up called Amboy this summer. "Reagan gave us political asylum to come to America in the early 80s," Cailan says, and some of the children of those immigrants (and others who came through a series of waves of immigration) went into the culinary field. "We [were] a bunch of junior sous-chefs . . . for the Wolfgangs, the Jean-Georges, the Charlie Trotters." Fifteen years later, "we're all executive chef level, but there's no Filipino restaurant to be an executive chef for. . . . So where do we go now? Do we pursue Filipino food?" The answer is decidedly, yes. Take Charles Olalia of RiceBar, who serves heritage rice from small producers in the Philippines, and tops it with house-made spicy longganisa sausage; brothers Chad and Chase Valencia at LASA; or Tom Cunanan at Bad Saint. "These people are giving up their careers to Filipino food," Cailan adds, and diners are reaping the benefits. A generation ago, that was a risk. When Amy Besa and Romy Dorotan planned to open a restaurant in Manhattan in the mid-1990s, they were met with criticism. "One well-known food writer (who had great respect for Romy's palate) told us, 'Please do not do Filipino food. No one will go to your restaurant!'" Besa recalls. "We were aghast to hear that, but then she said, 'Do Romy's food, then people will come.'" For the pair, who now own the acclaimed Purple Yam in Brooklyn (and Manila), that translates to blending new American techniques and local produce with dishes from the Philippines and other Southeast and East Asian countries. Today, opening a strictly Filipino restaurant is increasingly a sure thing. When Cailan heard the Valencia brothers, who started LASA as a periodic Filipino supper club, were looking for a space, he offered them the first residency in his incubator, Unit 120, in L.A.'s Chinatown. The duo opened for dinner on the weekends. "If they made money, they'd pay me rent. If they didn't," Cailan told them he'd "take care of the cost." Six months in, the LASA team managed to save enough money to take over the lease from Cailan, who is moving his incubator to a space nearby this summer. But as the Filipino restaurant movement comes of age, these chefs and restaurant owners face certain challenges. For one, how do they make the cuisine accessible while preserving tradition? "We're still convincing people what Filipino food is," Chase says. It requires "stepping up and being thoughtful of what you put on the table, bringing in education," says Natalia Roxas-Alvarez of Filipino Kitchen, a website and organization that promotes Filipino cuisine through recipes and events. At Bad Saint, that means calling all dishes by their names in Tagalog, a language spoken in the Philippines. "They know how to present food unapologetically to their audiences," Roxas says of the red-hot restaurant. After a few visits, diners "throw around the words, too," Genevieve Villamora, who co-owns the restaurant, says. Olalia at RiceBar felt the same way writing his menu. "When we opened, we kind of told ourselves it would be a long road of education." The idea is for dishes like sinigang, a sour soup, to become as familiar to diners as carne asada or nam prik, the restaurant owners explain. At Purple Yam in Brooklyn, Dorotan serves dishes rarely found in restaurants, like a charred eggplant salad made with a smoky coconut sauce. He also introduces diners to lesser-known ingredients, like bitter melon. While education is a focus, none of the chefs are held back by tradition—perhaps in part because pinpointing one "traditional" version of a dish within such a regionalized cuisine is near impossible. "What we grew up with is our reference point, but we don't stick with [that as] our boundary," Chad, who blends in a California approach to his cooking, explains. As Bad Saint's Villamora puts it, "The foundation of our menu is always what's traditional, but we're always pushing ourselves to redefine what's traditional." Many of these chefs are working to explore that together. 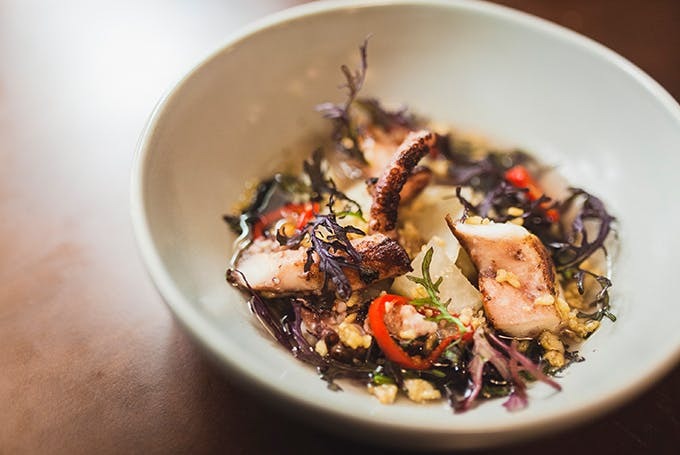 Next month, as part of the L.A. Times' Food Bowl, Cailan will host Filipino Food Fridays; he'll collaborate with chefs like Isa Fabro for a dessert night and host yet-to-be-named chefs for a lechón, or roast pig, festival. He also hopes to bring together Bad Saint's Cunanan, the Valencia brothers, Besa and Dotoran, and Sheldon Simeon from Tin Roof in Maui for a special dinner at Chefs Club this summer. These chefs are working together to create something long lasting, Chase explains. "That's one thing Alvin and I talk about. Last year was our coming-out party. . . . Now we have to not be a trend but be places people actually go to," he says. "That's going to keep us alive. These guys are here to make something meaningful and timeless."